The unimaginative and uncommitted blame lack of money for lack of action. But you don’t need money, position, or resources to make a positive difference where you work. All you need to bring out the best in others is a simple belief, a deep commitment to three behaviors, and a little time. You have to believe you have something to offer before you find courage to make a difference. If you don’t believe you matter before you succeed, success won’t help much. Lack of money, resources, or position is an excuse for inaction from those who don’t believe in themselves. Action expresses worth. 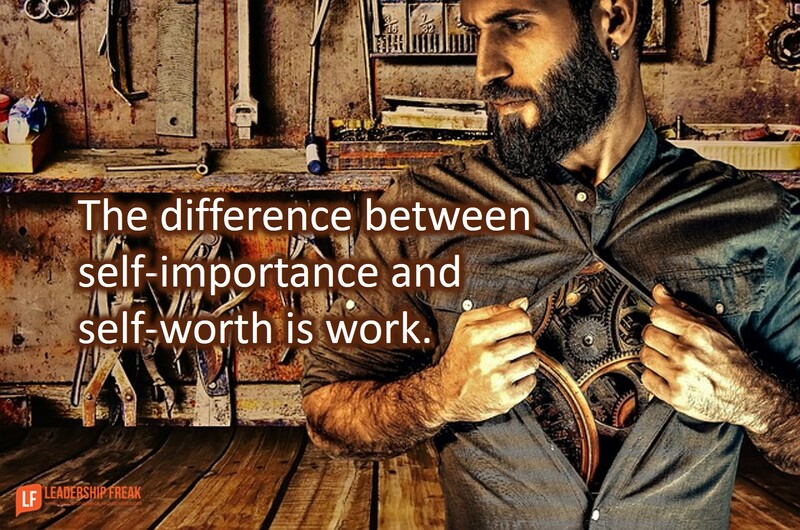 The difference between self-importance and self-worth is work. Jack Welch stutters. He said that his mother taught him to bring his “good stuff.” He didn’t allow frailty to prevent him from making a difference. Believe in your “good stuff” or go home and play videogames. You need a little skill and a lot of commitment to make a difference for your team. #1. Commit to see and be seen. Walk around in search of things to praise. Monday morning, walk around complimenting and thanking. Say thank you three times before lunch. Look at people. You listen with your eyes. Ask two questions before making one statement. Count out six seconds when someone stops talking. #3. Commit to celebratory touch. Pat people on the back. Give high fives and fist bumps. The need for touch is in our DNA. Avoid any type of touch that suggests familiarity or intimacy. Also, consider your culture. How much time could you dedicate to your three commitments. Fifteen minutes? Most can be fulfilled in the normal course of your day. You can’t make a difference by doing nothing and blaming others. What are some free or low cost behaviors that any leader might do? Which commitment is most difficult for you? What might you do to get better? Cheer The Supervisor. Like the turtle, they can only make progress when they stick their neck out. And it seems they operate with a rope tied to each leg. The beliefs we hold in the beginning of the journey defines the journey. Nagarajan, your simple sentence says so much. If we believe we can accomplish we will work to do much. If we believe we can’t accomplish, then we won’t get anything done, but we will be right. Commit to listening. I like the idea of counting 6 seconds when someone stops talking. This is great and I will implement this. I also like, look at people, you listen with your eyes, so true. Those 3 are very important. Belief I think is mandatory for any thing to happen in any sphere of life .Great post. Being a leader should never mean, you are now afraid to ask, now afraid to still learn and acknowledge that you still and always will require to learn. A leader should also be able to bring ‘humour’, ‘lighter’, ‘enjoyable’ moments to a team, Now I will go be quiet, before I truly let my brain and fingers take off 🙂 which needless to say brings self-control. another free low cost behaviour, to mind. 🙂 See, telling you, I need to be quiet now. Dan, great post. I love the story about Jack Welch and bringing your “good stuff”. John Wooden said, “Make everyday your Masterpiece”. Your absolutely right, if one does not see the value in thier contribution and thier contribution does matter- its merely a job. I share in my presentations that your contribution is a gift and the world needs your gift. When you discover your Gift, you become a Gift to us all.